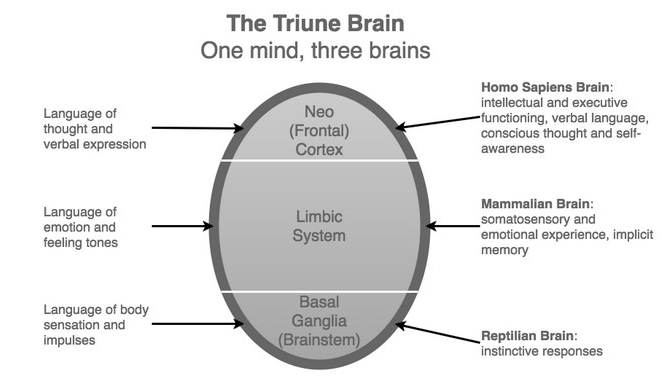 Refers to Paul MacLean’s infamous “Triune Brain” theory, whose basic idea is that every human brain contains three independent competing minds - the reptile, the early mammal, and the modern primate. Reptilian complex, or Primal Brain (Basal Ganglia). Paleo-mammalian complex or Emotional Brain (Limbic System). Often referred to as the monkey brain. Neo-mammalian complex or Rational Brain (Neocortex). The neocortex - the uppermost, outermost layer of the brain - is found only in mammals, and is linked with “high-level cognitive abilities” like abstract planning, tool-making, language, and self-awareness. “[each] with its own special intelligence, its own subjectivity, its own sense of time and space and its own memory." MacLean was saying, in other words, that every human brain contains three independent subjective consciousnesses. Triune brain theory developed within the field of psychiatry in the 1960's, and has never been embraced by neuroscientists. There are many inconsistencies from a direct physiological standpoint. However, as a model of psychology, it has very practical applications.